In this edition of Business Middle East we analyse the latest move of the Chinese central bank, and we take a look at the yuan’s long and winding road to the IMF. The Chinese yuan is among the safest currencies in the world, as investors and countries are considering it as an international trade currency. A rough week for China’s stock market and heavy losses in the Shanghai Composite Index pushed the central bank to cut interest rates on lending for the fourth time in less than a year. The unexpected move of the bank was aimed to give more confidence to investors and boost the slowing economy. The yuan’s path is the bright side of the story and remains on a strong trajectory to join the global currency basket. Some in the United States have questioned the yuan fitting the IMF criteria of a currency that can be used freely. However, certain Middle Eastern countries were quick to support the inclusion of the yuan and to use it as an active currency in the banks. 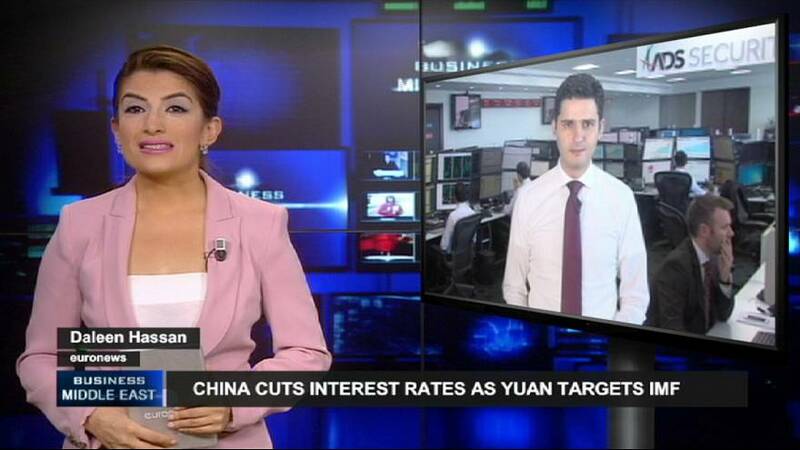 Will the yuan be legitimised? The main factors that led to the interest rate cut, the fourth of its kind since November, was the slowdown of investments and infrastructure spending as well as the Chinese stocks encountering a drop over the past two weeks. On other hand, the yuan is on its way to joining the SDR in October, where IMF board members will vote on whether it should be added to the international currency basket. The yuan has gained roughly a 14% average against other currencies since October 2013. Last week, Chinese and IMF officials held a meeting to discuss the technical evaluation of the yuan becoming an international currency. The Gulf and Middle East region have allowed the yuan to gain momentum in the Gulf Cooperation Council. UAE banks and China are currently trying to pass their currency swap agreement at an estimated value of 35 billion yuan ($5.7 billion). For further analysis on China’s central bank and the yuan, joining us is Nour Aldeen al Hammoury, chief market strategist from ADS securities. 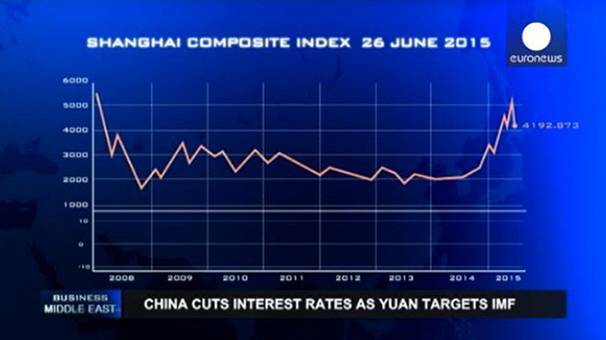 There is a lot of pressure on the Chinese market, how could the decision to cut the interest rates help resolve this? Yes, the intervention by the People’s Bank of China is not a surprise, especially after the recent economic slowdown and the notable decline in Chinese equities. However, it happened during the weekend and not during a normal meeting. In the past, PBoC policy has led to an excessive gains “recovery “ in Chinese equities by cutting main rates, deposit rates and the reserve requirement ratio rate. Moreover, the intervention eases the downward pressure as, essentially, the cheap money keeps on going around. This is helping to motivate investors in the market. The Chinese bond market took advantage of the decision to cut the interest rate, but it was the opposite for stock markets. Why? Yes, as expected, the bond yields eased back following the decision. However, the stock market suffered as global equities declined sharply, as speculation rises over a Greek exit from the eurozone. Therefore, the positive effect is likely to be delayed for some time, but once things are solved in Greece, we expect Chinese equities to stabilise. China’s yuan is now in vigorous efforts to join the world currency basket, how could that affect the US dollar and other currencies? The Chinese yuan is among the safest currencies in the world, as investors and countries consider it an international trade currency. There are many swap deals between China and other countries, meaning that there is no US dollar in any trade. It’s all about the Chinese yuan and the local currency of the other party. In the meantime, there will be no effect toward the US dollar, but of course, the Chinese yuan poses a challenge for the dollar. Recently, Emirates signed an agreement with China to allow UAE banks to open accounts in Chinese yuan. Why was this proactive move taken before the vote? As noted, the Chinese yuan is now considered one of the safest currencies in the world. It increased by an average of 14% against the major currencies from 2013 until today. This is despite all of the crises, central bank interventions, global currency wars and currency devaluations that we have seen. In the UAE, there has been a notable increase in trade with China. Investors are favoring an exchange of Chinese yuan directly with UAE dirhams, which is faster and more economic than changing dirhams to US dollars and then to Chinese yuan. You can share your thoughts and suggestions via our euronews Facebook page, Euronews BUSINESS.